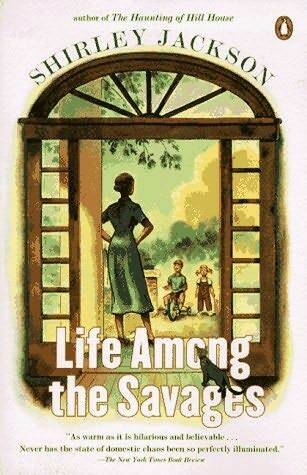 It seems like I started reading Life Among the Savages a long time ago. I have probably finished 5 other books since I first started reading it. I am not entirely sure why I set it aside. I read Shirley Jackson’s We Have Always Lived in the Castle and loved it. And I have a copy of The Haunting of Hill House on my TBR. 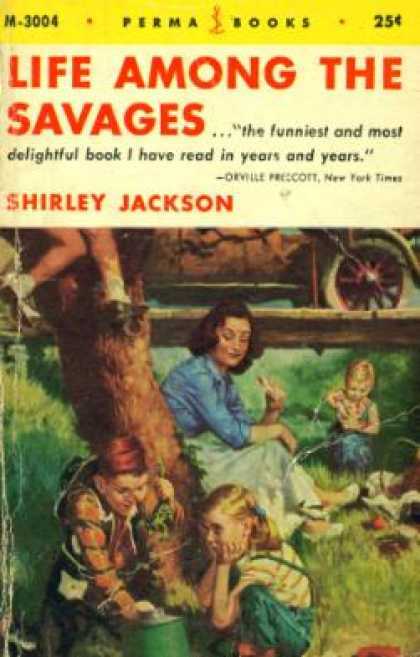 A memoir of Jackson’s young family in the early 1950s, Savages started out pretty strong. It was fun to read about the culture shock of moving from the cramped, expensive, city to rural Vermont. Big house, critters, learning how to drive, etc. 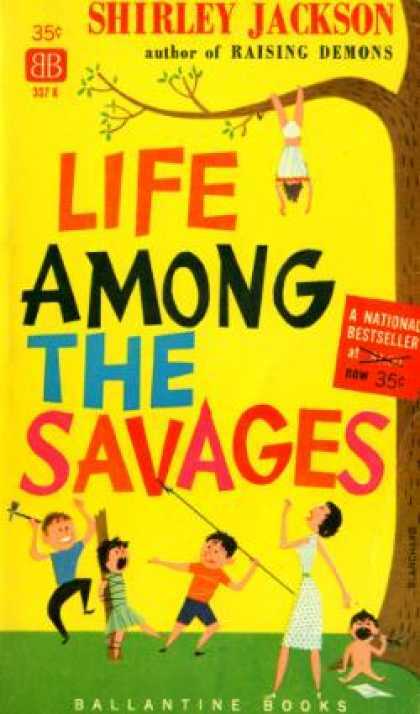 Some of the stories about her children (the savages) were also pretty amusing but ultimately I found them a bit boring. Jackson’s writing isn’t boring, her recollections are quite witty, but ultimately, her kids just aren’t interesting enough to hold my complete attention. Especially when contrasted with Jackson’s gripping fiction. Not surprisingly given my tastes, the parts I found most interesting were those that deal with the minutiae of everyday life. (I know, I know, boring stories about things, I find interesting. Boring stories about kids, not so much.) One such story includes a description of a suit for her young son costing something in the neighborhood of $45. This seemed liked an enormous amount of money for the time. When I consulted an on-line inflation calculator it indicated that $45 in 1950 would be about $397 today. Who among us is going to spend $397 for a suit for a child? And indeed Jackson did not pay the $45 for the suit, but just the fact that clothes cost that much relative to salaries is astounding. When I was telling John about this, he pointed out that the tiny closets in our 1937 house certainly supported the notion that clothes were not always purchased in the abundance like they are today. Of course that $45 suit in 1950 was no doubt made by an American who was paid an actual living wage rather than the measly sums given some poor 10-year old in a developing country. But I digress. And the fact that I digress to such a degree indicates that I don’t have too much to say about this book. 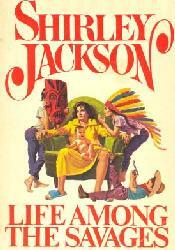 Some of you may find it worthwhile, but I am going to stick to Jackson’s fiction from now on. It sounds interesting but I'm sorry it didn't live up to her fiction for you. I love the different covers though – thanks for sharing those! I like the variety of cover art too. The last one I think is my favorite. Those are some interesting covers! 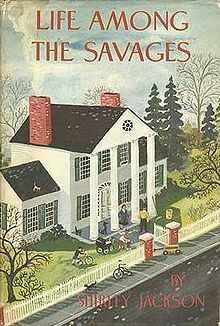 I haven't read anything by Shirley Jackson, but We have Always Lived in the Castle is high on my list. The title of this book makes it sounds interesting and controversial, but I think I'll follow your advise and read her fiction first. Love Shirley Jackson – in all her guises. I've bounced back and forth between her fiction and her 'life' stuff. I think I like them both the same but for different reasons. Love all the covers for Savages. I LOVE Jackson's fiction. I have been told for years that I ought to read this one, but for some reason, I keep putting it off. I, too, would find that $45 suit far more fascinating than her children, I'm sure (even though I love children, but adults writing about the antics of children, when they aren't writing children's fiction? Well, a little goes a long way for me). Verity: At least it was a nice foil to the tumultuous War and Peace. Jeane: I think I agree with you. Either that one or the first one. Iris: Well, the savages are her children so I don't think there is anything controversial in that. But do read We Have Always Lived in the Castle. Fantastic read. Tessa: Since I have only read one of her novels, I am looking forward to reading more of them. Emily: I think you summed it up just right. What a shame this didn't work for you – I've been excited about this, since it sounds like another Pronvicial Lady from a writer I love… I'm still going to give it a go! What interesting covers – my favourite is the last one. I've had this on my to-be-read list for awhile now, but it doesn't really sound that promising. Whilst it didnt live up to your hopes being a Savidge I feel I need to have this book.